See also: scoops. The general public usually refers to these tools as “scoops,” but in the food service industry they are called “dishers.” A scoop lacks the moving blade that separates the food from the bowl. “Disher” is an old word (e.g., see the 1897 patent title below), though it is not found in this sense in the Oxford English Dictionary. Dishers are an important tool in portion control. In the United States, the sizing system for dishers is based on the number of portions that can be scooped from a U.S. liquid quart. The table below is based on this relationship. In practice, however, manufacturers’ don’t size dishers very accurately (see Kit Chen's blog). 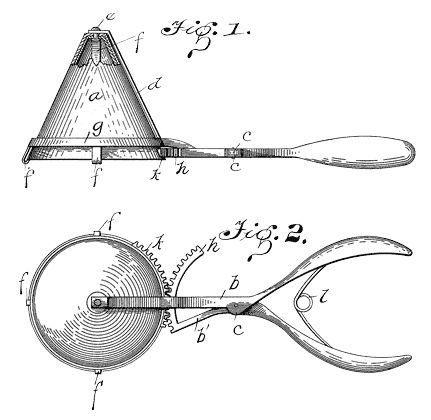 As an example, Vollrath, a highly-regarded manufacturer, makes dishers in two styles, one with squeeze handles and the other operated with the thumb. The capacity of the #40 thumb style model is given as “¾ [oz] (22.2 [mL])”; the capacity of the #40 squeeze handle model is given as “7/8 [oz] (25.9 [mL])”. The table below lists only those sizes we know to be commercially available, and omits a number of values inconsistent with the preciseness possible with these tools. Ice Cream Mold and Disher. In his blog at http://bowlofplenty.blogspot.com/2009/08/dishers-aka-ice-cream-scoops.html, Kit Chen shows that, according to the manufacturers' own specifications, some makers’ scoops don’t meet the number-in-a-quart rule. He has calculated dishers’ capacities from the manufacturers’ figures for the bowl’s diameter. Of course, he assumes the manufacturer hasn’t rounded off the diameter for publication, and that the bowl is spherical. It would be interesting to find some of the worst offenders he identifies and actually measure their capacity with water from a graduated cylinder. Copyright © 2010-2012 Sizes, Inc. All rights reserved. Last revised: 26 January 2012.